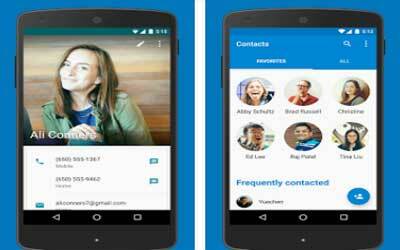 Google Contacts APK 1.4.9 lets user manage every contact efficiently with just one app. Generally, contacts will be saved automatically when you send email or communicate via Google platform. In past time, email address can only be used in same account, so user will do some handwork to write at mobile device. However, Google has already updated this app with capability to synchronize automatically to another platform or device. For Android users, integration feature are very helpful because they do not have to export or import file from one app to another. Therefore, Google Contacts will be the best app for contact. There are many features on this app. You can see two groups on main interface. Firstly, users will see list of their contact address that recently used or frequently contacted. On top of list is the most address that user communicate every time. Another list is contact with rare or seldom contacted. Google lets this app make sorting and screening to prevent duplication. It will save time and makes people easy to searching. All of previous features might be familiar for you. Even beginner can grasp basic function of this app. However, Google has anything on sleeve to attract more people use this app. Integration and synchronization are main factors why people choose this app. As it mentioned above, Android users grow extremely fast every year. You can use smartphone to communicate with friend or family then their address needs to be saved. For business activity, Google contact assist to make group for certain contact, so you can find them immediately. Setting mode is simple and similar with other Google services. You can use primary number telephone, choosing language, etc. Export and import features are available to help user saves contacts from non-Google platform. Therefore, Google Contacts for Android will manage your contacts in simple and efficient way.